﻿ Multi-lingual Booking Engine Your booking engine now works in 21 languages, including Greek, Hebrew, and Hindi. You can localize the description for your rooms, rates, and additional booking engine info for any or all languages. Your booking engine will appear in the natural language for any visitor and will display your localized description, if there is one available. Your booking engine now works in 21 languages, including Greek, Hebrew, and Hindi. You can localize the description for your rooms, rates, and additional booking engine info for any or all languages. Your booking engine will appear in the natural language for any visitor and will display your localized description, if there is one available. When user visits a website, their browser sends a basic set of information along with the request, including the user’s language preference. Your booking engine uses this information to display the interface elements, including buttons, text, etc, in the user’s preferred language. 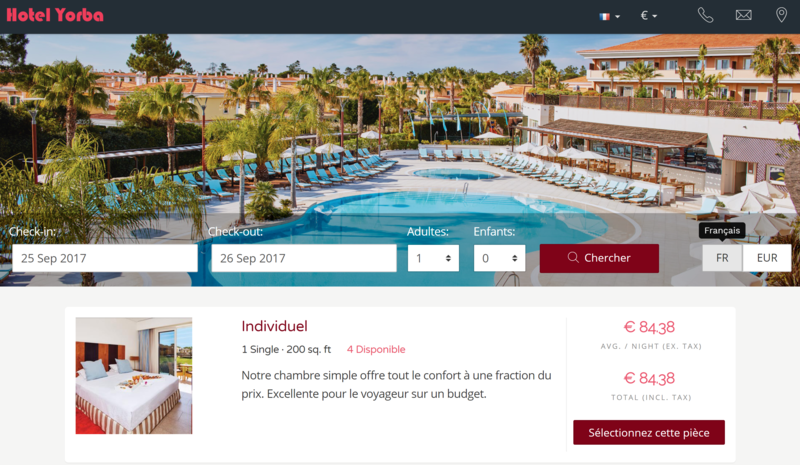 A user visiting your booking engine for the first time from Kansas will see everything displayed in English, whereas a visitor from Paris will see the same information displayed in French. As a side note, the user’s geographic location is independent of their language preference. The example above would be reversed if the user from Kansas was on a business trip in Paris. In this case, your booking engine would still display English, despite their location, assuming their browser is set to English. The user takes their language preference wherever they go. This all happens without the user making any decisions or changes to their settings. However, it may be the case that a user wants to view your information in a language different from what they have set in their browser. In this case, they can use the dropdown in the navigation bar to select their preferred language. Your booking engine will now be displayed in their selected language. You can localize your hotel’s information for room and rate descriptions, and any additional hotel descriptions for any of the 21 available languages. The default language is English, which is used as the standard language when a localization is not available for a room or rate in your hotel. So, what is a ‘localization’? A localization is a description of some interface element in a language other than the default language (English). Suppose a hotel in Montreal has rooms A and B, and would like to provide information in both English and French. The hotel can add a localization for room A, so when a visitor whose default browser language is French visits their booking engine, the information for room A will be in French. In this example, the information for room B will display in English because the hotel has not provided a localization for room B yet. All other interface elements for the booking engine (buttons, menus, etc) will be in French, regardless of whether the hotel has provided a localization for this language. To add a localization for a room type, go to ‘My Hotel > Rooms’ in the left navigation menu, and then select the room type to localize. Scroll down to the section titled ‘Booking Engine’ and select the language you wish to add/edit from the dropdown menu. Enter the information for this room type in the language of your choice and click ‘Save’. Now go to your booking engine and select a date range where this room is available. 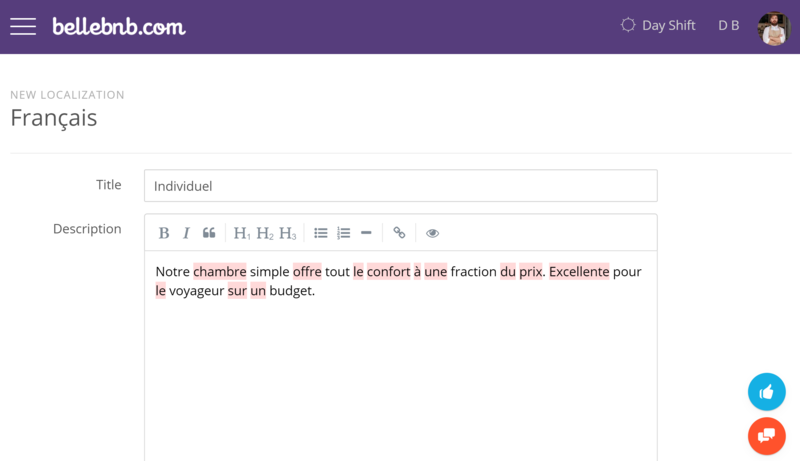 Toggle between English and French in the navigation bar to view your description for this room in each language. Notice that your other rooms don’t change, because they haven’t been localized for French yet, but the rest of the interface items change when you make your language selection. You can localize a rate plan by making a language selection under ‘Booking Engine’ when viewing that rate plan’s details. To add a localization for your booking engine ‘About’ page, go to ‘Channel Manager > My Booking Engine’ in the left navigation menu and make a language selection in the ‘About this Hotel’ section. In addition to making a language selection, your visitors can also view prices in their own currency by making a selection from the dropdown menu next to languages, in the navigation bar. Your visitors can select from over 140 world currencies. Your booking engine will automatically work in 21 different languages, which covers the vast majority of the regions available in the world (notable exception: Esperanto). Your room descriptions will be switched to accommodate the selected language when available, or will default to English. 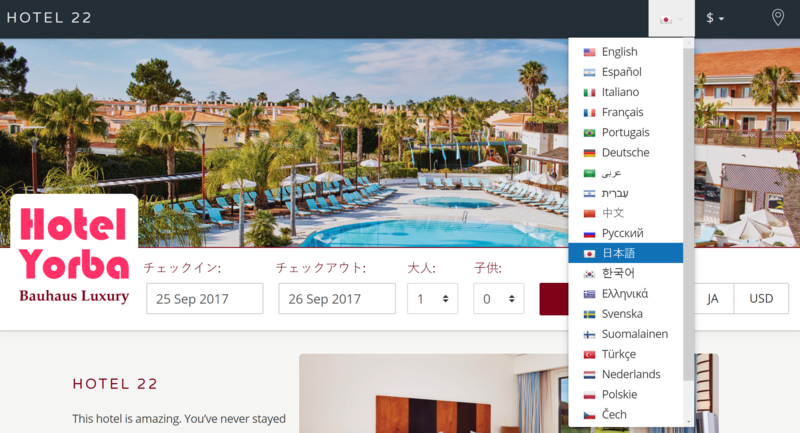 You can add localizations for the languages that are important to you, but it’s not necessary to cover all 21 languages for every room/rate/booking engine. Do make sure that your descriptions in English are correct and understandable, as this is the default language for your booking engine.